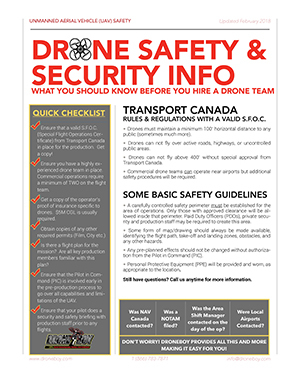 In this industry there are a lot of names and acronyms used to describe what we generally refer to as “drones”. Some people call them multirotors, others prefer unmanned aerial vehicles (UAV), unmanned aerial systems (UAS), remotely piloted aerial systems (RPAS), quadcopters, octorotors, and, I could go on… What the really are is awesome and that’s because drones have an unprecedented ability to fly safely and reliably just about anywhere in 3D airspace. To make this even better they can do this with a payload on board. We can mount gimbal-stabilized cameras to our drones and capture previously impossible photos and video and other data. Of course there are a whole lot more things you can do with drone technology but these are the main things that we do here at DroneBoy. A skilled DroneBoy certified pilot with years of experience flies the drone usually via remote control. In all but our smallest units the pilot is assisted by a camera operator who, using a second remote control system, operates all camera functions including control over which way the camera is pointing at all times. A small onboard flight control system (FC) assists both the pilot and camera operator with their jobs by monitoring the environmental conditions, movement (inertia monitoring unit – IMU), location data (compass, GPS & barometer/altimeter) as well as user inputs (directional commands from the pilot & camera operator). This flight control system (FC) takes all this data in real time and manages the outputs to the motors, propellers and camera control systems (gimbal) to create controlled and stable flight as well as smooth, precise camera positioning. Varying degrees of FC influence can be set from full GPS stability to manual where all control is given back to the pilot. Autonomous (fully automatic) flight is also possible with many our systems enabling preprogrammed, repeatable flights over larger areas or for special applications. This all sounds complex and it really is, but the technology has reached a “tipping point” where it is safe, reliable, effective and easy to implement for a reasonable price. This is a very exciting time for drones, for people like us who work with them and for people like you who may be looking for the perspective that only a drone can offer.